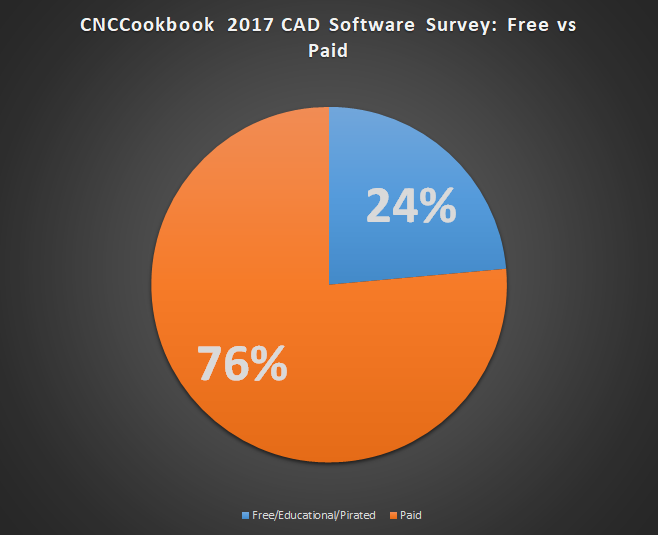 It’s time to present the results of our CNCCookbook 2017 CAD Survey. 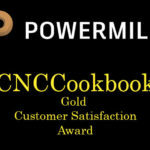 This update adds the Customer Satisfaction Awards. There were just under 500 responses to our question about production CAD packages. Thank you all very much for participating! 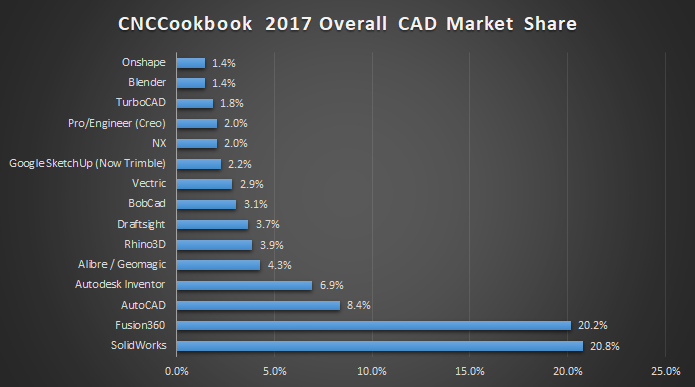 We have CAD Survey data for 2013, 2015, 2016, and now 2017, so we’ll be able to see a little market trending here too. I’ll get on to market share shortly, but first, let’s go over Customer Satisfaction. We then calculate a score based on the percentage of each type of response that was received. Based on those responses, we award a Gold and a Silver Customer Satisfaction Award to the first and second place packages. Congratulations to Robert McNeel and Associates! 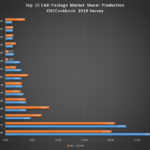 A whopping 71% of respondents who use Rhino3D said, “It Rocks!” I have to confess, Rhino3D is my personal favorite CAD package among the several I use regularly. 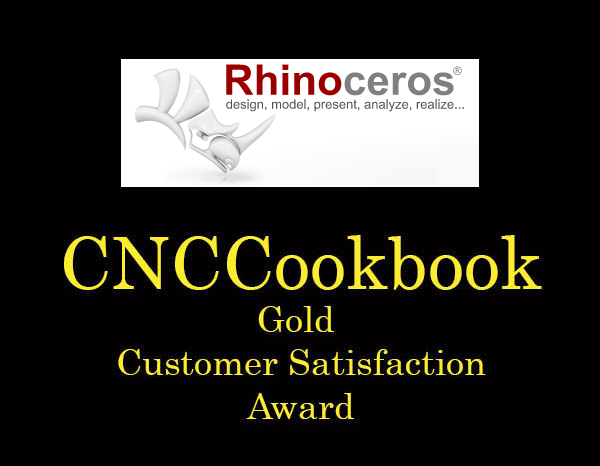 Rhino3D moved up 13 positions to take the #1 slot. BobCad moved down 8 positions versus 2016. 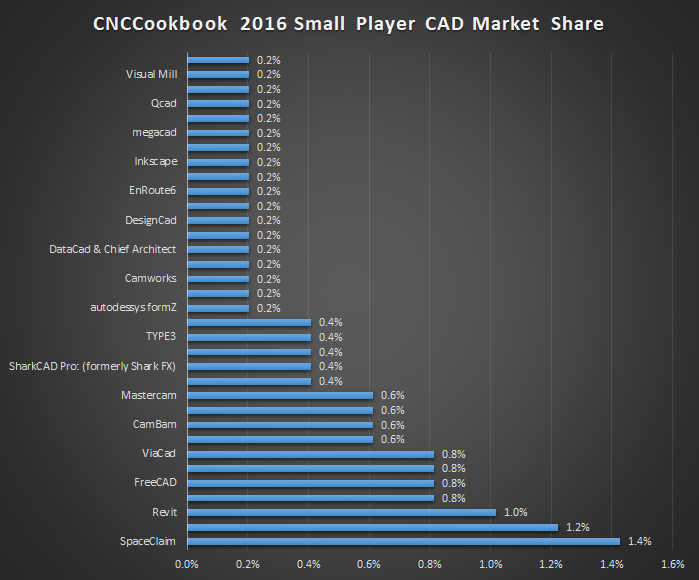 Autodesk Inventor was up 7 positions and took 3rd place behind Rhino3D and NX. 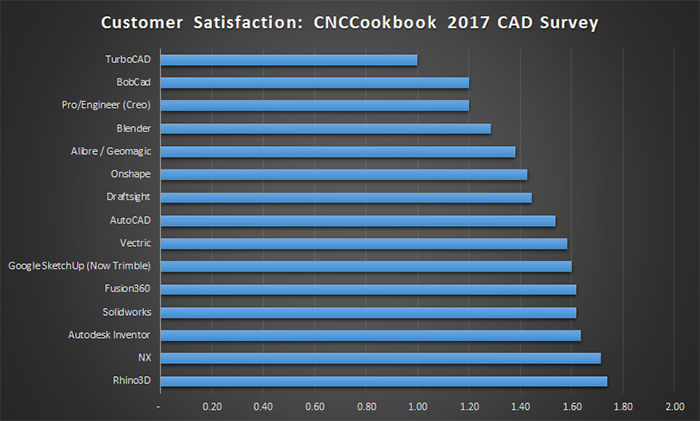 Solid showing for Autodesk! Draftsight, Dassault Systems 2D product was down 7 places. 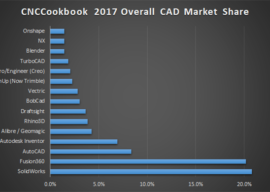 AutoCad itself, the King of 2D was also down 4 places. It’s not clear to me that 2D packages are where it’s at. We live in and are machining in a 3D world. 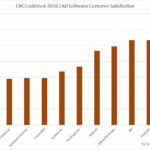 Fusion 360 and SketchUp both came up 6 places vs 2016. The Top 4 are the same both years and in the same order. AutoCAD and Inventor are pretty much exactly where they were. 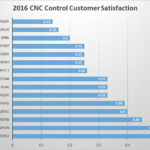 Fusion 360 has gone from 14.6% to now 20.2%. SolidWorks is up a touch too. 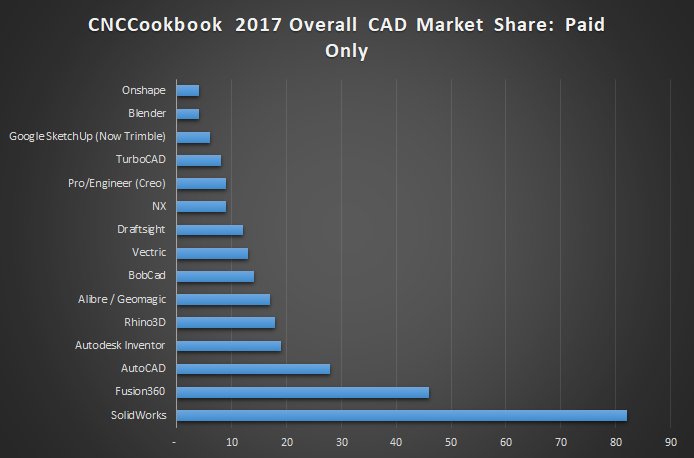 So, Fusion360 is gobbling share from players below 4th place. OnShape has really fallen off, going from 3.9% to 1.4%. That’s a big upset for them and may account for some of their increasingly aggressive negative marketing campaigns. One thing’s for sure, something needs to change there. They’ve raised a ton of Venture Capital and their investors are not going to be complacent if there’s a lack of growth. Alibre/Geomagic gained a bit, going from 3.1% to 4.3%. That company has been newly separated from their original acquirer, so it’s interesting to keep an eye on them. The Vectric products are looking good too, having come up through the ranks since 2016. In aggregate, 55 packages were tried some 1428 times. This suggests the average respondent tries about 3 packages before settling on one. 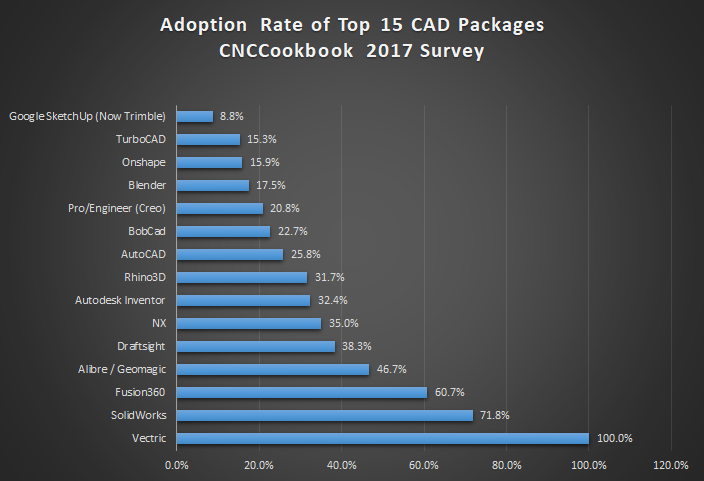 Vectric’s 100% adoption rate leads me to suspect it was bought as a CAM package and users discovered the CAD is pretty good there too. 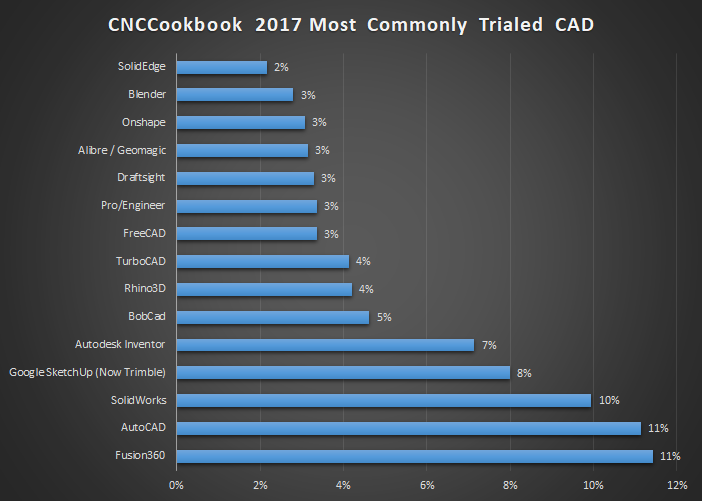 Fusion 360 and SolidWorks are about where they were in 2016, but Alibre has gone way up from a 30% adoption rate to 46.7%. NX is also up substantially from 28% in 2016 to 35%. 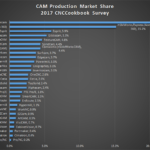 Much like our CAM Survey, we can see that Fusion 360 is here to stay, but the major players aren’t going anywhere either. This year, for the first time, a question was asked to determine the relative Free (plus educational and pirated) share vs paid share of the packages. Only about 1/4 of the responses represent free, educational, or pirated software. The survey was completely anonymous, and we didn’t ask anyone to reveal name or email, so respondents were more likely to be truthful. There’s no denying that free is a powerful tool to drive adoption, so I find it all the more impressive when a tool that has very low percentages of free users does so well in the market share comparison. That changes the picture quite a bit, doesn’t it? We still have the same four on top, but they trail Solidworks by a much larger margin. Packages like Rhino3D and Alibre also start to look a lot more competitive. The interesting thing about free, is just as nature abhors a vacuum, shareholders abhor a lack of profits. Sooner or later most free things tend to get a lot less free. Free is typically used as a tool to accelerate growth until market dominance can be achieved. I have quite a lot more analysis to do, as well as Customer Satisfaction Awards to present. I’ll do that via an update and republishing of this article. Make sure you’re on our mailing list if you don’t want to miss future installments. Just scroll down to sign up. I am a small time hobbyist, but have been in the game for awhile. I’m not sure why Onshape would have fallen off quite honestly. 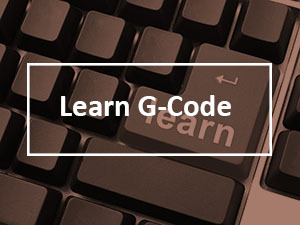 I use it both professionally and as a hobbyist and it is one of the best CAD programs that I have used. 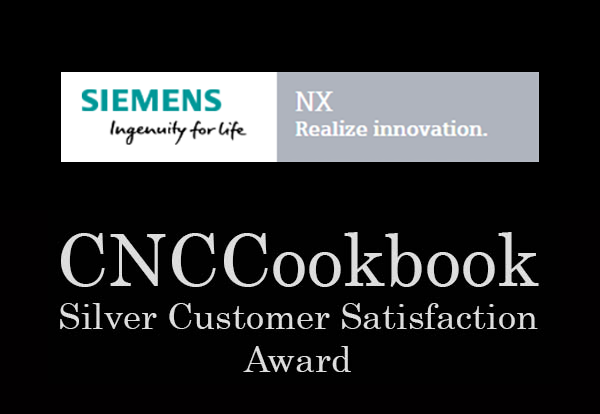 (I’ve used NX, ProE, Inventor, and Solidworks to name a few). 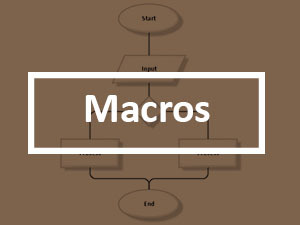 Has anyone ever used another CAD program that has new features added on a weekly basis? The customer service and support is also incredible. Hopefully that drop off is just a result of the crowd that responded as 500 is only a very small portion of the active CAD community. Michael, the feedback is pretty consistent: this audience is not that enamored of OnShape. There may be all sorts of reasons. It’s not especially hobbyist friendly, for example. They changed what had been a decent free policy to a much more restrictive one early on. That leaves a bad taste. There are issues for those who don’t have a fast enough Internet connection. Then there’s the issue of integration with CAM. When I see how negative a lot of their marketing has turned, I can’t help but feel that they’re seeing the same trends and are thrashing around trying to find some answer to fix it. I liked Onshape initially as well. 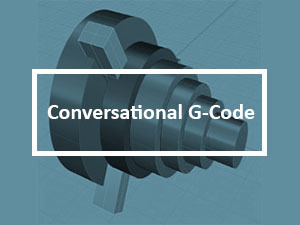 I especially like the web interface as the future of CAD/CAM/CAE. Their software works without a hitch on all my machines Windows and Linux alike, even with my space mouse. But, Solidworks also demo’ed (as I recall) a web-based offering some time ago, so web-based CAD is not ‘if’ but ‘when’. 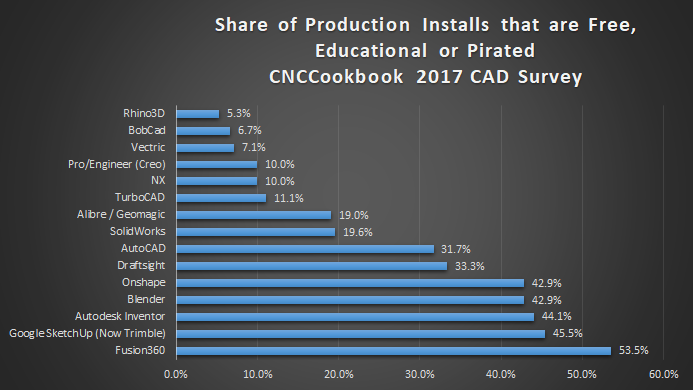 In both cases, I really like the concept of one file that holds all information, CAD,CAM,CAE, etc… I hope others like Solidworks and CREO go a similar route. Making sure all of the files are regen’ed and sync’ed is a real hassle, especially without expensive PDM. 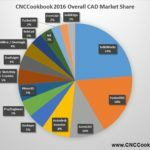 Even Solidworks, who stated out as CAD only, now offers CAM, and CAE in one package. 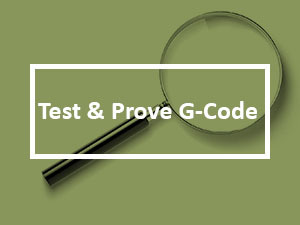 Hi, is this survey done among companies in USA? Or it is world wide survey? It’s a world wide survey. Will there be a 2018 edition soon?